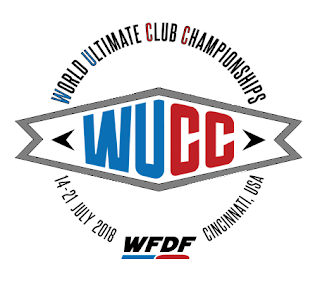 Forty (40) of the 128 WUCC teams will be competing in the men's division at WFDF's 2018 World Ultimate Club Championships, July 14-21, in Cincinnati. Australia, Great Britain, and host country United States will be represented with the most teams at the international ultimate tournament with 3 men's teams each. Overall, twenty-five (25) different countries are represented in the men's division. Compare to the mixed and women's divisions. 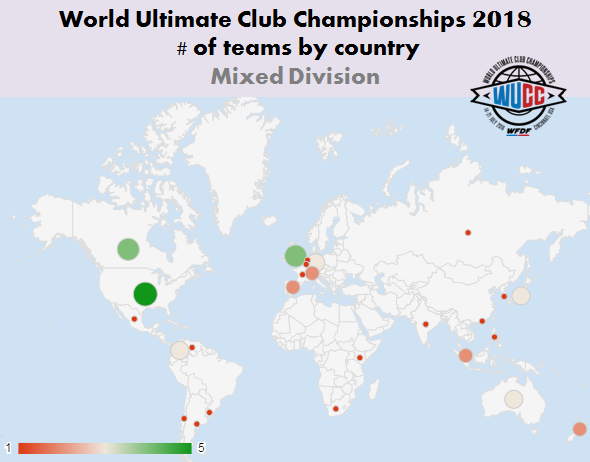 Forty-eight (48) of the 128 WUCC teams will be competing in the mixed division at WFDF's 2018 World Ultimate Club Championships, July 14-21, in Cincinnati. Host country United States will be represented with the most teams at the international ultimate tournament with 5 teams; Canada and Great Britain are each sending 4 teams. Overall, twenty-six (26) different countries are represented in the mixed division. Four (4) countries - Chile, India, Kenya, Uruguay - are competing in their first WFDF's World Ultimate Club Championships. Compare to the men's and women's divisions. Forty (40) of the 128 WUCC teams will be competing in the women's division at WFDF's 2018 World Ultimate Club Championships, July 14-21, in Cincinnati. Host country United States will be represented with the most teams at the international ultimate tournament; Canada and Japan are each sending 4 teams. Overall, twenty-one (21) different countries are represented in the women's division. There are 128 teams set to compete at the WFDF 2018 World Ultimate Club Championships - July 14-21; Cincinnati, Ohio in the Men's, Mixed, and Women's divisions. 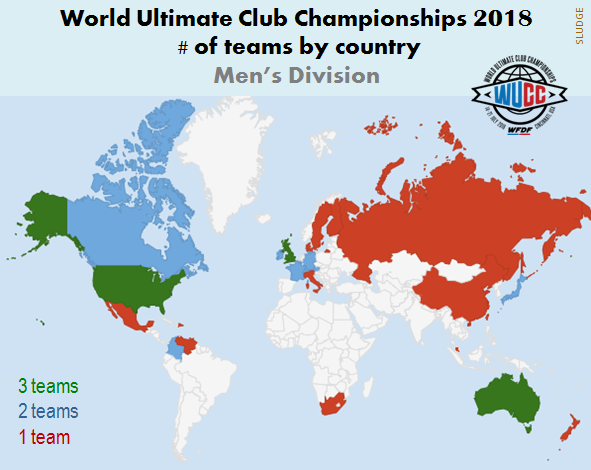 The United States of America leads with the most overall teams (13); Canada and Great Britain are represented by 10 club ultimate teams each. 4 = # of countries represented at WUCC* for the first time. All are competing in the mixed division. WFDF's World Ultimate Club Championships begin in just one month! This international event welcomes club teams worldwide to compete for the championship in the men's, mixed, and women's club division. 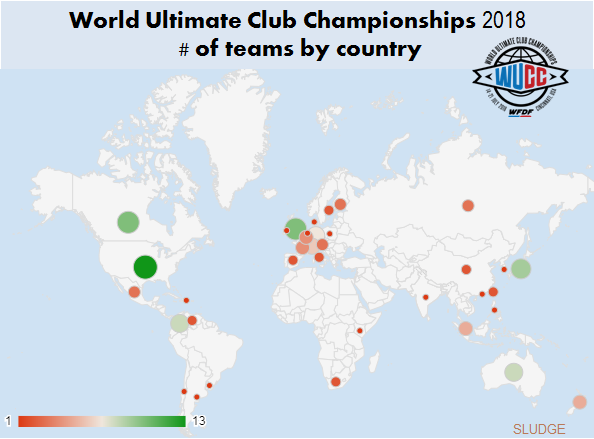 There are 128 teams from 36 different countries expected in Cincinnati, Ohio, USA, for WUCC 2018. The United States has hosted WUCC twice previously - in Honolulu, Hawaii (2002) and in Madison, Wisconsin (1993). The WAFC 2018 spring clique season started in March and just ended on Saturday (June 9). It was a long season, which happened to be the 40th season SLUDGE has played together. Fall 1998 was the first season the team played in brown shirts because one of the players on the roster worked for the military and nabbed a bulk for cheap at the base store. 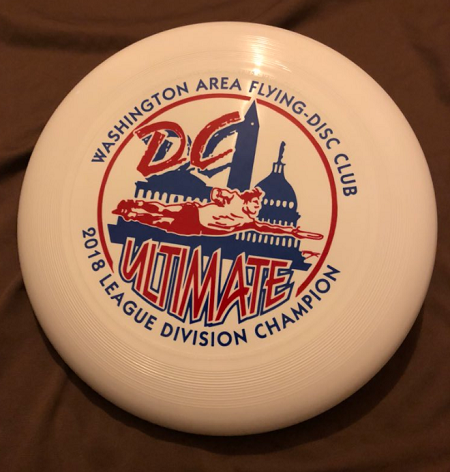 During this 2018 season, commemorative ultimate discs were secretly ordered and distributed to unsuspecting teammates. 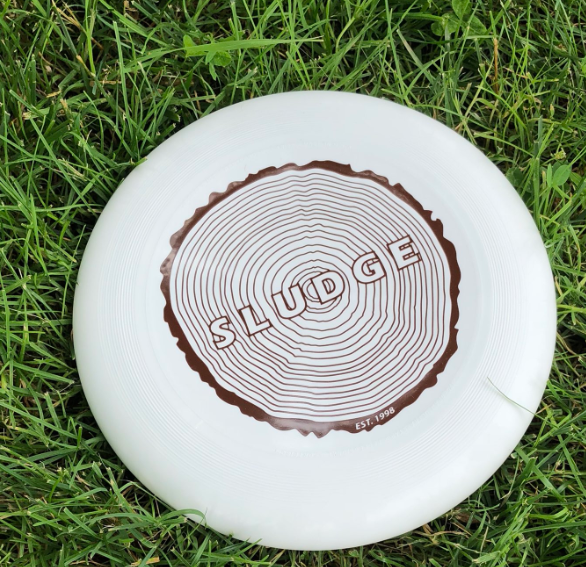 SLUDGE posted a (5-2) regular season record. The postseason tournament was played at the Polo Fields, a place we have many, many pickup games many, many times. SLUDGE advanced to the championship by winning Saturday's pool play (2 games), then went on to win the final by the score of 15-6 (8-3 half). Just what we needed—another piece of plastic! Get ready for the celebration parade on Tuesday.